Another unloading-the-pantry recipe. Yogurt and granola always sounds like such a healthy combination, but in undergrad, yogurt for me meant sugary, strawberry goop from the dining hall and granola meant even sweeter crushed Nature Valley bars. No doubt having giant bowls of that for breakfast contributed to the poundage I gained during freshman year. If only I had known how easy it is to make granola at home. This recipe is simple and versatile; you could probably substitute the honey for maple syrup, walnuts for pecans or almonds, dark raisins for dried cranberries, the possibilities are endless. And I like getting little pops of the coarse sea salt with the overall sweetness so I tend to add a little more, but to each his own. I’ve gotten into the very good habit of making a batch every Sunday morning, which makes the whole apartment smell spicy and toasty, and having a little bit each day for breakfast with some tart Greek yogurt. In a large bowl, toss the oats with cinnamon and salt. In a medium bowl, stir together oil, honey, brown sugar, and vanilla until completely combined (I found that microwaving the mixture for about 30 seconds made mixing a lot easier). Pour honey mixture over the oats and mix, using your hands. If you like clumpy granola, gather some of the mixture in your hand and make a fist. Repeat until all oats are evenly coated. Pour mixture onto prepared baking sheet, spreading it out evenly. Bake for 10-12 minutes and then remove from the oven. 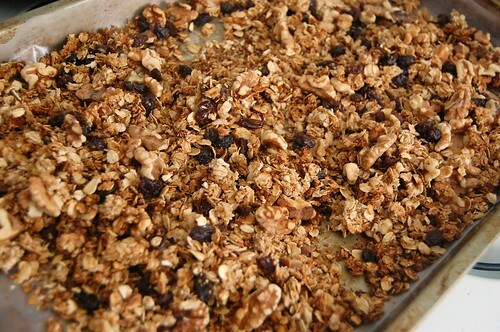 Flip the granola with a large spatula, add the walnuts and stick the granola back in the oven. Bake for another 10-15 minutes, or until the granola is golden brown. Let cool completely and then sprinkle with raisins. Store in an airtight container. « Butter and blueberries: a sign of spring? You are currently reading Do-it-yourself granola at Notes on Food.